Much like my Bisquick substitute recipe, I like to keep a batch of this homemade cornbread mix on hand at all times, especially in the colder months when cornbread is a quick and easy, yet satisfying, accompaniment to seasonal soups and stews. In a mere five minutes, you can mix up enough for between 3 to 6 meals, depending on the size of your family. Just measure out all of the ingredients into a large mixing bowl and whisk them together thoroughly. When you want to make cornbread or corn muffins, you simply add oil, eggs, and milk. Growing up, my Dad always baked cornbread in one of these ring-shaped baking dishes. I really don’t know much about it, but several years ago he surprised me with one of my own at Christmas. I think maybe it’s from the ’50s, and cornbread is the only thing I use it for. After all this time it would just seem weird to me to eat cornbread in any other shape. If anyone out there has any info on these, I’d love to hear it! 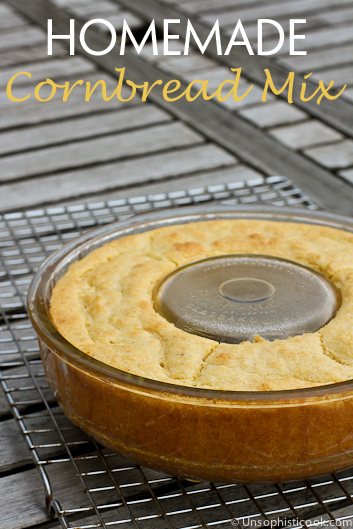 One last thing — our family prefers a sweet cornbread, so this mix is very similar to Jiffy cornbread mix. However, you can easily adjust the amount of sugar to your liking. Enjoy! 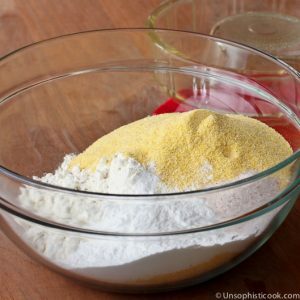 Measure all cornbread mix ingredients into a large bowl. Whisk thoroughly to combine. Store in an airtight container for up to 6 months. Whisk together one cup of the cornbread mix, oil, egg and milk. Pour batter into greased muffin cups or pan. Bake at 400 degrees for approximately 15-17 minutes. I’m participating in 31 Days of 2012 this October with Nesting Place and a whole lot of other bloggers. Find all of my 31 Days of Homemade posts right here! These taste EXACTLY like Jiffy. I’m never buying the box again! Thanks for sharing!! I always keep cornbread mixes on my grocery list. Not any more. Hi, I was just wondering, How long do you bake this and what temp? Please and Thank you! Hi Heather! Bake at 400 degrees for approximately 15-17 minutes. My mom makes her meatloaf and cooks it in a pan like that and it is moist and juice and delicious done in the microwave! How many batches does this recipe make? Thanks! Hi Lindsey! It should make 6 batches of 6 muffins or 3 batches of 12 muffins. Is there a substitution to make this gluten free? I’d love to know! Unfortunately I’m not very well-versed in converting recipes to gluten free, Sheila, but hopefully a reader that is will see this and step in to help! Hi, I am also in love with the baking pan! Can you tell me the size of it? I found one on ebay that was 8 3/4″ Wasn’t sure that was big enough. Yep, I just checked and that’s the correct size, Kelley! So smart to have a mix on hand. We are huge cornbread lovers and we like it sweet too. I love that pan you baked it in, I’ve never seen one like it. Can I love this times 1000? This is so smart, loving this series, Tara. Not only is it better for you, it tastes better, too, to make these things at home. This looks so good! sorry. i don’t care for Yankee (sweet) cornbread. I love cornbread, so I am grateful for the recipe. I have some quick questions. Are you using AP flour here? Have you ever tried subbing buttermilk for the milk? I’m also wondering if adding creamed corn to the batter will make a big difference in the other liquid measurement(s). I like my cornbread loaded with jalapenos, grated cheese and sometimes even crisp chopped bacon , so I’m looking to see if anyone has made any successful alterations. Hi Lucy! Yes, I did use all-purpose flour in my mix. I haven’t tried substituting buttermilk, but I don’t see why you couldn’t. I’ll give it a try next time we make cornbread and report back. As for adding creamed corn, that sounds really yummy! I think you’d just want to use slightly less milk. You should be able to add the other mix-ins without any adjustments. What’s the brand of that baking dish? I’ve never seen one before. Love it! It says Glasbake on it. I looked it up and found several of them on Etsy, so you might take a look there! I read some of the descriptions and they mention using it for meatloaf and as a Jell-O mould, but we’ve always just used it for cornbread. I actually have all these ingredients- using this for dinner tonight!